March 8, 2009 by rwb, under Microcontroller. 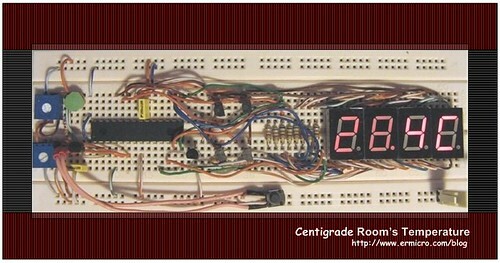 The seven segment display is one of the most popular numeric displays used in many microcontroller applications because it’s cheap, robust and reliable. The seven segments actually consists of 8 LED (Light Emitting Diode) and it’s come with various sizes suitable for various numeric display application such as digital clock, counter, thermometer, humidity, etc. 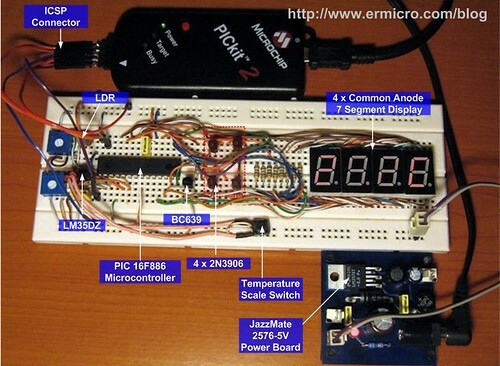 On this project we are going to show you how to drive this type of display and this time we will use the Microchip PIC16F886 microcontroller to display the room’s temperature both in Centigrade and Fahrenheit scale. From the above picture you could see how complex the circuit was on those days; the circuit consists of separate IC such as 8-bit microprocessor (Zilog Z80), counter timer circuit (CTC), 4K EPROM (Erasable Programmable ROM, this ROM type can be erased only by exposing it to the UV lamp) for the firmware (the board basic I/O function and BASIC language interpreter), 2K RAM for the program and the I/O controller. Thanks to today technology this complex circuit is already put into single chip known as the microcontroller and we don’t have to use this UV lamp to erase the program anymore (you must be laugh right know, but on those days that’s the only way to do it) but what remain the same is; we still use this seven segments display, mostly for displaying the numeric value. Displaying the seven segments is just a matter of applying the correct forward bias voltage to each of the LED’s segment in the seven segments package; for example if we want to show the digit “3” than we have to apply the forward bias voltage on each of the A, B, C, D and G LED segments. The segment pins out is vary among the types and the brands, therefore you have to find out the correct pins for each segments and the common pin as well before you can start to use it. The designed I’ve made here not solely to show the room’s temperature with the seven segments, but it serve as the good learning tools as well, as we will explore the PIC 16F886 features such as ADC (Analog to Digital Converter), PWM (Pulse Width Modulation) and the timer counter capabilities in one shoot. Ok now lets fasten your seat belt as we will run through the design concept here. First is the display, all the common anode seven segments are connected to PIC 16F886 microcontroller’s port RC0 to RC7, because the microcontroller’s port I/O could not sink the 8 LEDs current all together so we use the 2N3906 PNP transistor (T1 to T4) to sink the current; you could read more about sinking and sourcing I/O port in Powering Your Microcontroller Project article posted on this blog. Differ from usual design I put the NPN BC639 transistor (T5) for driving the four PNP transistors (T1 to T4) with the PWM signal in order to control the seven segments display contrast. The display contrast is controlled by the LDR (light dependent resistor) together with 10K trimpot serve as the voltage divider input to the PIC16F688 microcontroller analog port AN1; by detecting the light intensity captured by the LDR, this room’s temperature circuit will automatically adjust the seven segments display contrast according to the room’s light intensity. The darkest the room’s the brightest the seven segments display and vise verse. Secondly the temperature sensor, on this circuit we use the National Semiconductor LM35DZ precision centigrade temperature sensor. The LM35DZ will produce linear voltage output of 10 mV for each degree of the temperature increment in centigrade scale. Together with the 1 Volt voltage reference input provided by 10K trimpot (R17) on the PIC16F886 microcontroller’s VRef+ (4) and VRef- (5) pins, we could precisely measure the room’s temperature on the PIC16F886 microcontroller’s analog port AN0. 12. HI-TECH C PRO for the PIC10/12/16 MCU family V9.60PL5 (you could not use the HI-TEC PICC Lite version on the Microchip PIC 16F886 microcontroller, but you could use the Hi-TECH C PRO in Lite Mode). 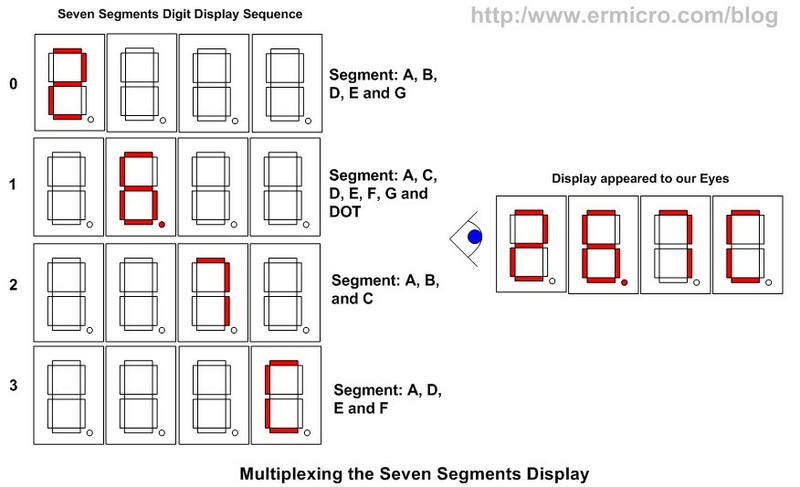 As you’ve seen from the schematic above, displaying the entire seven segments digits at the same time would be not possible because every digit will have different information to be displayed, in other word every digit will display different LED segment combination; therefore the solution is to display it one at the time. If we display the four seven segment digits in sequence fast enough, it will appear (give an illusion) to our eyes as we display all these segments simultaneously; this method is called multiplexing. The multiplexing algorithm is best implemented using the PIC timer/counter TIMER0 peripheral; by letting the TMR0 counter register to overflow and generate interrupt every 3.2 ms, we could display each of the seven segments digit every 3.2 ms; the total time to complete displaying the whole digits is about 12.8 ms (4 x 3.2ms) and this time is already sufficient to avoid flicking appear to our eyes (you could read more about PIC TIMER0 peripheral on the Basic Servo Motor Controller with Microchip PIC Microcontroller article posted on this blog). The seven segments LED display is store in the SSEG constant array, therefore by assigning this array to the PIC16F886 microcontroller’s PORT C (RC0 to RC7), the corresponding LED’s segment on the seven segments display will be pulled to the ground (low), and by pulling low the corresponding PNP transistor (T1 to T4) base lead attached to the PORT B, we could make the seven segment to display it’s content. The room’s temperature is base on the voltage level output supplied by the LM35DZ sensor, this precision centigrade temperature sensor from National Semiconductor is connected to the PIC16F886 microcontroller’s analog port AN0. In order to get the precision ADC result on the PIC16F886 microcontroller, we use the 10 K trimpot (R17) to supply the 1 volt external voltage reference to the microcontroller’s successive approximately circuit. Make sure you adjust this trimpot so the voltage across VRef+ (Pin 5) and VRef- (Pin 4) is measured approximately 1 volt, this is the first important step after you complete building this project. The ADC peripheral on the PIC16F886 in general is similar to the PIC16F690 (you could read more information about the PIC ADC on the PIC Analog to Digital C Programming article posted on this blog); there are only minor different on setting the ADCON0 and ADCON1 registers (for more information please refer to the Microchip PIC16F886 microcontroller datasheet). 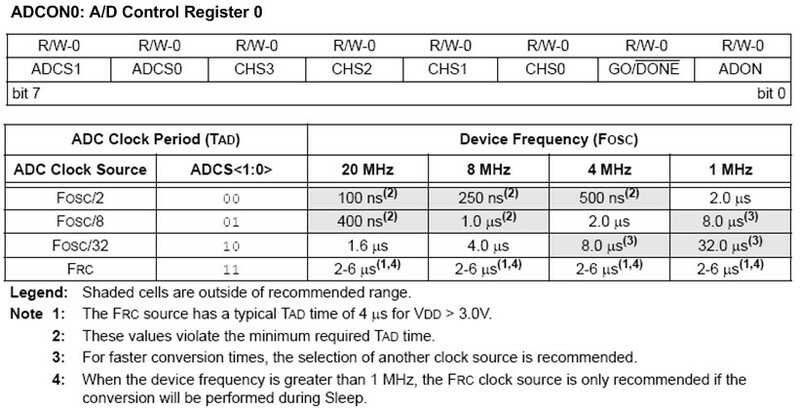 Because we are using the internal clock (FRC) of 8 MHz, then we set these ADC clock selection bits to ADCS1 = 1 and ADCS0 = 1. The channel selection bits CHS3, CHS2, CHS1 and CHS0 is used to select the appropriate analog channel input where on this project we use 2 analog inputs, one for the temperature sensor (AN0) and the other for the light intensity sensor (AN1). The 10-bit analog to digital conversion result format in ADRESH and ADRESL registers is determined by the ADFM bit on the ADCON1 register, by setting this bit to “0” the result will be left justified, this mean the first 8-bit MSB bits will be placed on the ADRESH register while the last 2-bit LSB bits will be placed on the ADRESL register. Assigning ADFM bit to “1” make the 10-bit ADC peripheral to put the first 2-bit MSB result on the ADRESH register and the last 8-bit result will be placed on the ADRESL register (right justified result). One of my favorite features on this project is the ability to automatically control the brightness of the seven segments display according to the room’s light intensity; this feature make this circuit to use low power consumption by dimming the seven segment’s LED on the bright light room and brighten the seven segment’s LED on the complete darkness. The LDR (Light Dependent Resistor) and the trimport circuit is called voltage divider circuit (you could read more about the voltage divider circuit on the Basic Resistor Circuit article posted on this blog), this circuit simply provide the voltage level to the AN1 analog input channel; more light received by the LDR the higher the voltage level input to the AN1 port and vice verse. As you notice from the code that we are not directly assign the ADC result on the ADRESH register to the CCPR1L register which control the PWM duty cycle output; this is due to the behavior we required; that the more light intensity received by the LDR the more higher the ADC value result we’ve got but on the other hand we have to assign less PWM duty cycle value and vice verse. As you see from the statement, there is no configuration bit address specified on the code, but the HITEC-C PRO compiler is smart enough to place the BORV21 (brown out reset at 2.1 volt) configuration bit to the correct address 0x2008. Third we read the switch and doing the Centigrade to Fahrenheit scale conversion as needed. At last we display the room’s temperature value by calling the SSEG_putnum() function; this function work by separating the numeric value digits and assign each digit to the corresponding DispDigit array variable using the appropriate seven segment constant SSEG array definition. 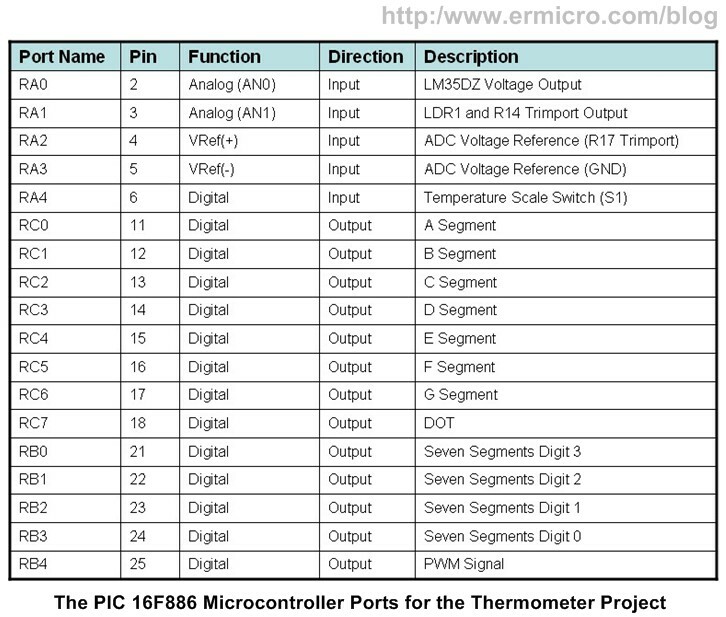 Next the PIC TIMER0 interrupt function will use the DispDigit array variable and DigitCount variable for multiplexing the output through PIC16F886 microcontroller’s PORTC and PORTB. If I am using servo motor and I want to multiplex seven segment displays as well…how am I going to allocate the timer0?? I am thinking of using timer0 and timer1 simultaneously but I think this will trigger contradiction…or I just assign everthing in the timer0 routine is that possible…thanks a lot. Yes you could use both Microchip PIC16F886 microcontroller TIMER0 (8-bit) and TIMER1 (16-bit) and even TIMER2 (8-bit) peripherals at the same time. I would like to ask, beside using timer0 for displaying seven segment…what other type of technique can i use?…actually I have tried to display them by normal codes in the main function…it works, but not clear and unstable…thanks a lot. 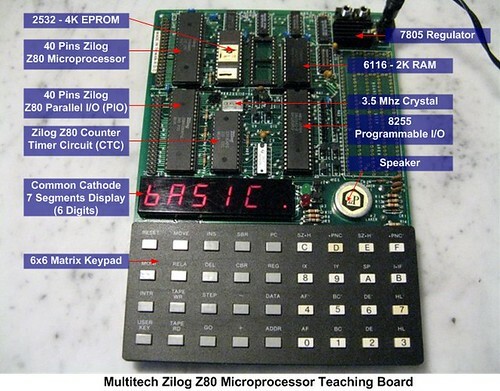 Basically you could use any of the Microchip PIC TIMER peripherals to do the Seven Segment multiplexing. 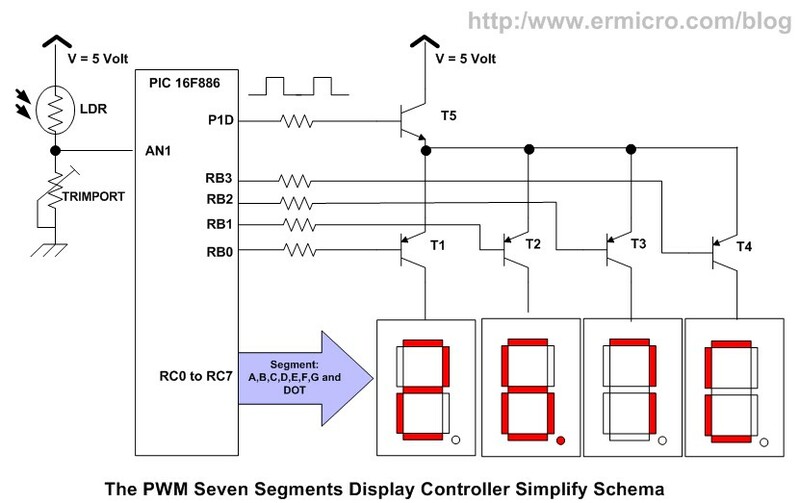 Yes, I have tested it using other timer interrupt and it works very well, thanks a lot…I have another question here…actually I want to optimize the usage of every single pin in pic16f690…and if I am not using the dot pin in the seven segment, from the seven segment array in your source codes (SSEG), how am I going to use that particular pin (the pin that suppose to connect to the dot pin) for other output purpose? Sorry I still haven’t finished…I am only using RC0 to RC6 for seven segments…but in the array, I have to assigned value for RC7 as well…I mean what is the approach as we cannot assign only 7 numbers for PORTC, like PORTC = 0b0001111, the 8th bit just ignore it, impossible right? Hi, your method is really great..i never think that before haha…btw I am curious how are you going to drive servo using that pin? You could not use the Microchip PIC16F690 PWM peripheral on RC7! First, not all the Microchip PIC16F690 pins could be assigned as PWM peripheral output, for more information please read “H-Bridge Microchip PIC Microcontroller PWM Motor Controller” article on this blog. 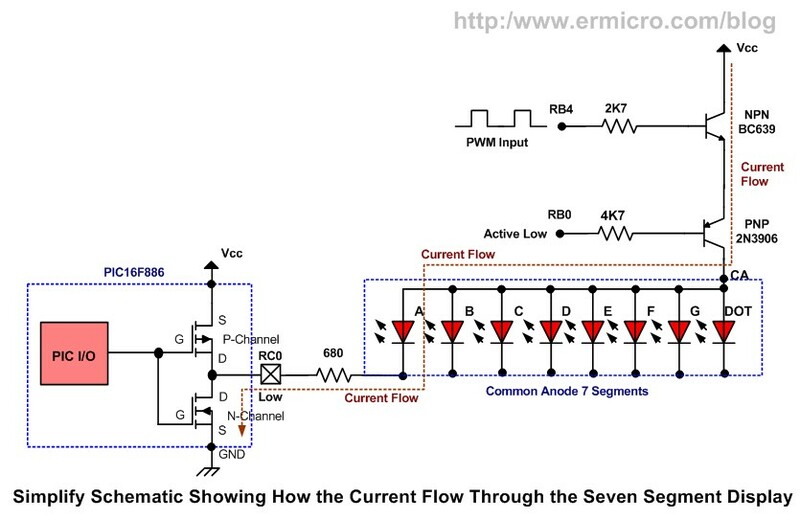 Secondly if we use the PWM peripheral to drive the servo motor it means we have to lower the PIC16F690 operating frequency please read “Basic Servo Motor Controlling with Microchip PIC Microcontroller” article. Yes, I know…I mean how to utilize different port pins to multiplex seven segment…because I need P1A pin to drive servo, but I have solved the problem using your idea(using logical operators), and it worked for multiplexing seven segments for different port pins…I have tried your method to drive servo as well and it worked but I would like to try with the pwm feature in the mcu…I have tried to drive the servo (only servo in my circuit), it can turn clockwise and counter clockwise. I can turn it in small degree as well by gradually increase the bit in CCPR1L&CCP1CON automatically in a FOR loop, but when it comes to control the degree increment using push button, it becomes very unstable, the voltage from my voltage regulator will suddenly drop down to unusual level…can I know the problem please…if possible can I send you my source codes?? Please help thanks a lot. There is no relation between the PIC microcontroller C code and the sudden voltage drop of the voltage regulator when you press the push button which effecting the servo motor operation. The voltage regulator should maintain a constant voltage output as long as the operating load is still within its specification limit, that’s why it being called the voltage regulator. You should recheck your circuit. OK, thanks a lot…so is it recommended to drive a servo using a 9V battery (maybe energizer)? Its depend on your application, for remote operation, sure you need a battery such as 9 volt (PP3) to operate your circuit but for permanent location where the electricity is available is cheaper to use the power adapter to provide DC supply to your circuit.